If you’re looking for a fun place to dine on Fort Myers Beach, look no further than the Yucatan Beach Stand. 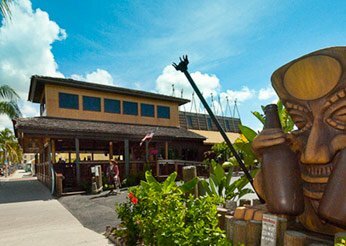 This restaurant is located on Old San Carlos Boulevard, easily viewed on the right side of the bridge by those headed to Fort Myers Beach. The Yucatan offers delicious seafood like grouper, Mahi Mahi, local shrimp and oysters and has a full bar so you can sip on your favorite island drinks. Sit inside or out and enjoy the live music as you dine. The Yucatan also has a outside bar that is surrounded by swinging chairs to add to the fun island vibes.